After the rains of Easter Sunday, we were thrilled to see a clear day the next morning. As expected, Rome was even more beautiful lit up by the sun. Like most other great European cities, Rome is best explored on foot, and we had perfect weather conditions to do so. 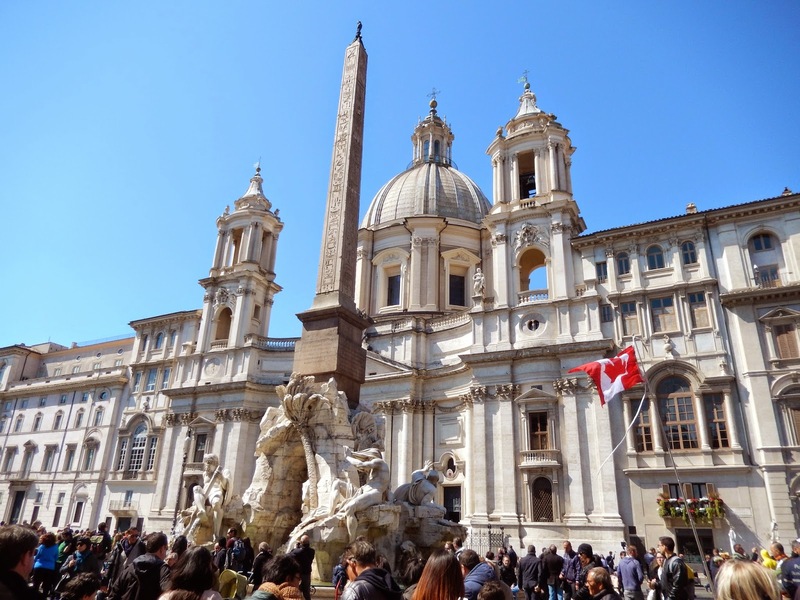 We met our guides at the hotel and ventured out to see the Rome that was a centre of art and architecture during the Renaissance. Much of the best of that world was housed in great churches, as you shall see. To make the most of our time, we traveled by Metro to our first stop. 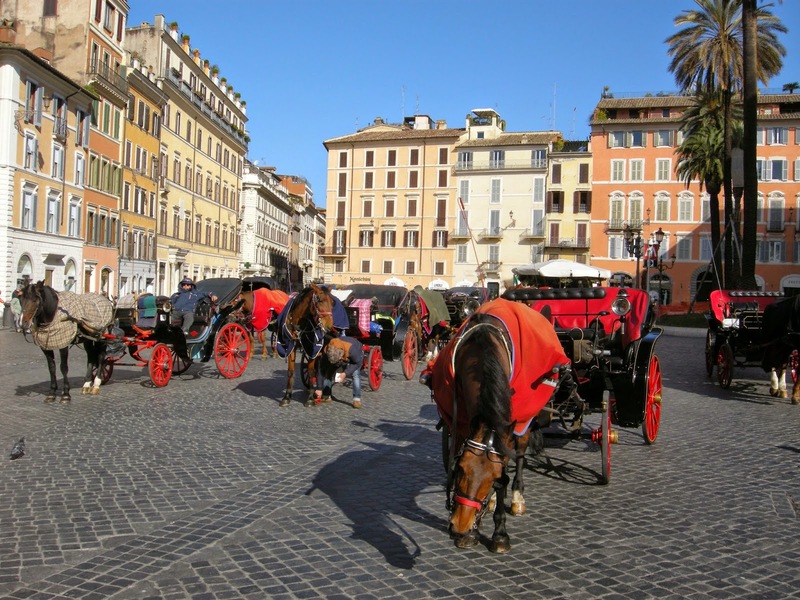 We began the day at the square below the Spanish Steps, so beautiful and inviting. 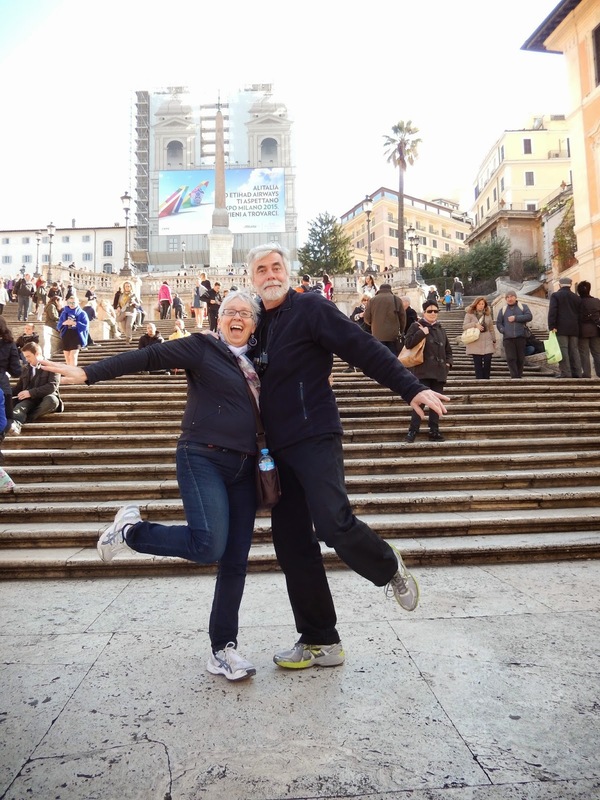 This was an opportunity to pose with a variety of backgrounds: in front of the 135 steps themselves, beside the Fontana della Barcaccia in the piazza, or even among the horses and carriages awaiting tourists. No rain today. Let's celebrate. 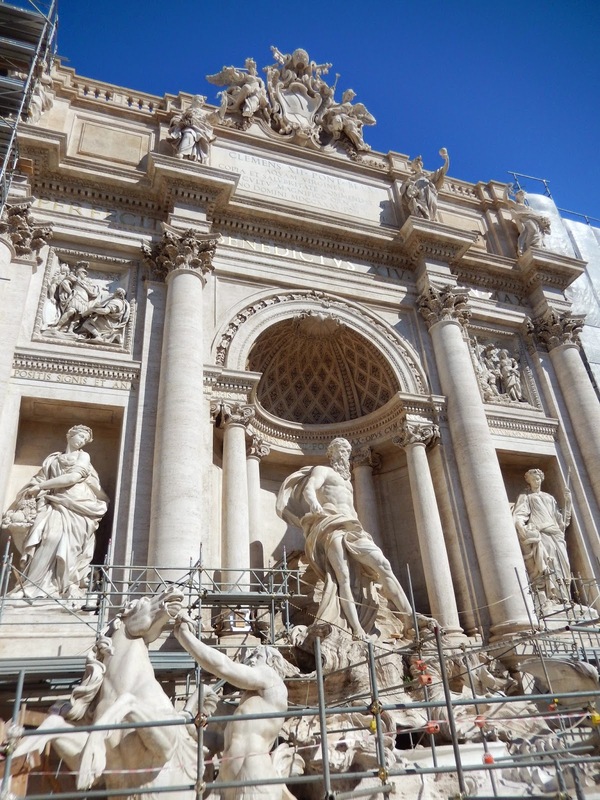 A short walk away is the Trevi Fountain. Part of it was under scaffolding but there was enough to see to still be impressive. Some of the students tossed coins into the makeshift pool created during renovations, while others joined me on the ramp in front of the statues to get a closer look at the art of the fountain. We continued our stroll through the restored Galleria Sciarra, past the Colonnade of Hadrian's Temple, to Piazza di Montecitorio. 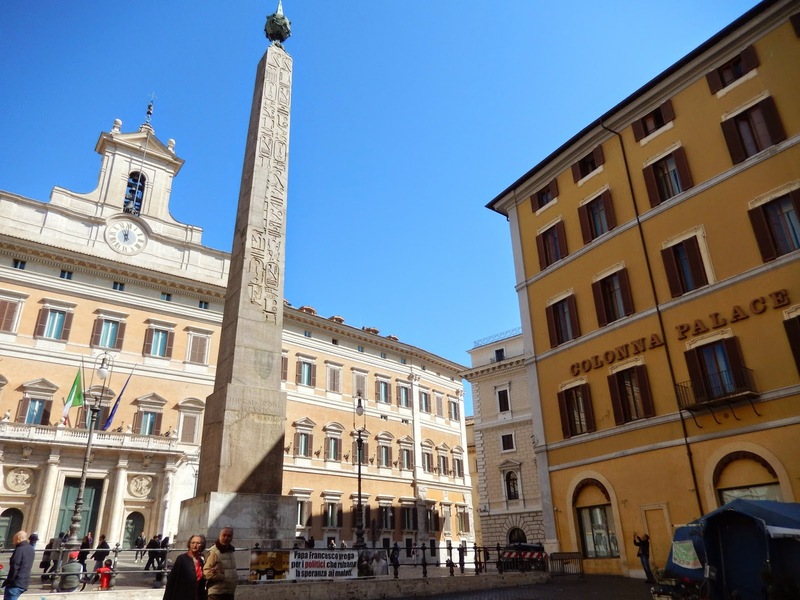 There were two monuments of note along the way: the beautiful Marcus Aurelius column in the Piazza Colonna with its elaborately carved images, and the obelisk of Monte Citorio in front of a 17th Century Palace now used as the Chamber of Deputies for the Italian Parliament. Walking in Rome reminded me of spending time in Paris. While tourists flock to the major sites, such as the Fountain of Trevi, there are wonders to be found with every twist and turn of the streets. And with blue skies as background on this day, I loved everything that I saw. 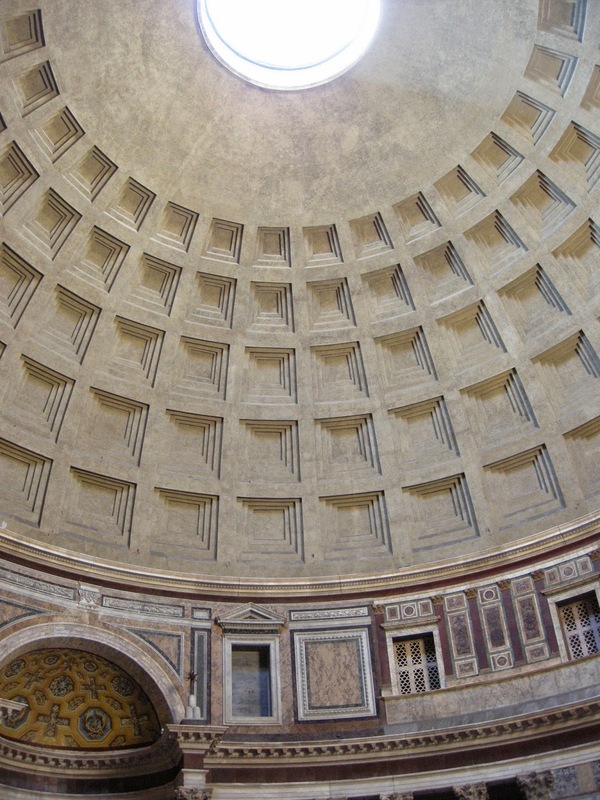 We made a longer stop at the Pantheon because of the special nature of this building. Once a Roman temple, it is now a Catholic church. This is important because the building's survival depended on it being "saved" by the Christians who destroyed many other Roman buildings. What a marvel it is on the inside! The massive dome has a hole in the middle, and when it rains, the centre of the building gets soaked. Of course there is a drainage system which must work well, since there were no signs of the waters from the previous day. 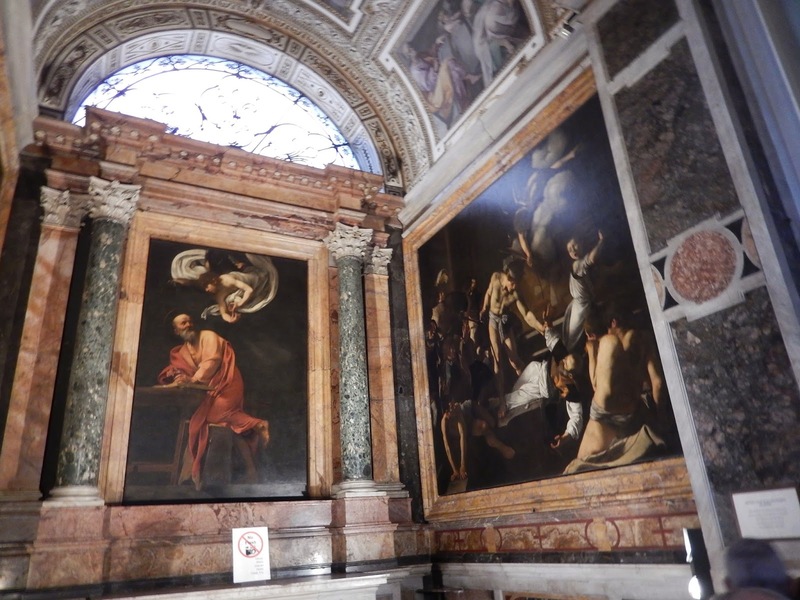 I had heard that there was a church nearby that housed three Caravaggio works, so our guides directed us there next. 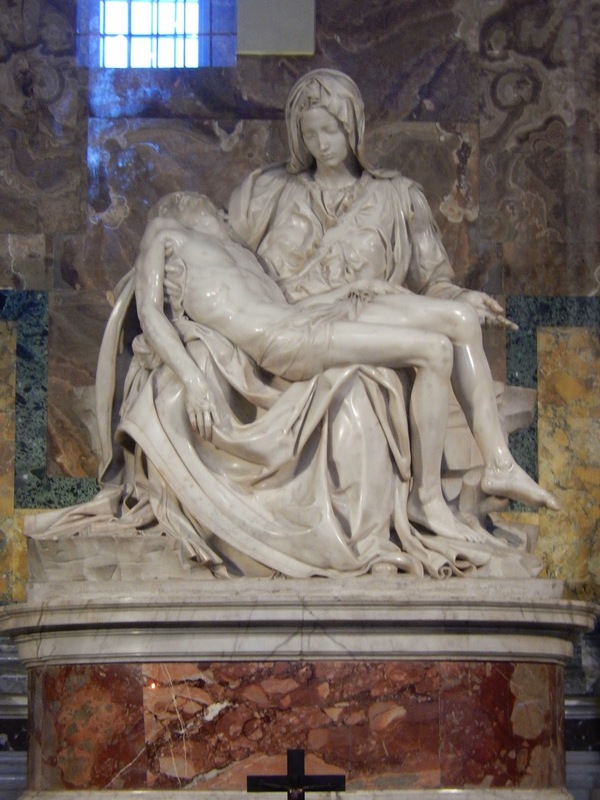 Again, I was reminded of the wonder that is Rome: in a small basilica yesterday, there were statues by Bernini; today's treat were large paintings in a corner chapel with the unmistakeable Caravaggio style. Impressive! 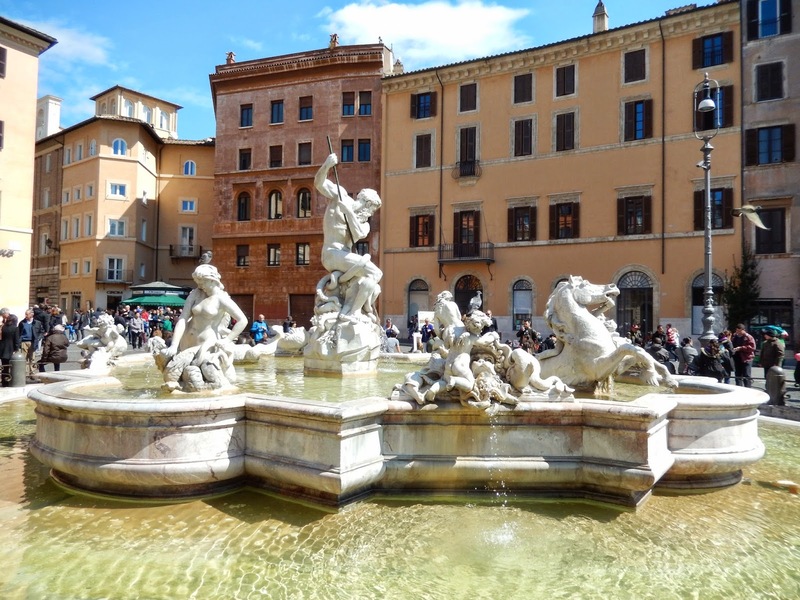 The last stop on our walking tour was the Piazza Navona, a large open area with two lovely fountains and several artists set up to do quick sketches of tourists. We said goodbye to our guide and found a restaurant in the open air to enjoy lunch. I could have stayed in this place much longer but there was much more of Rome to see. 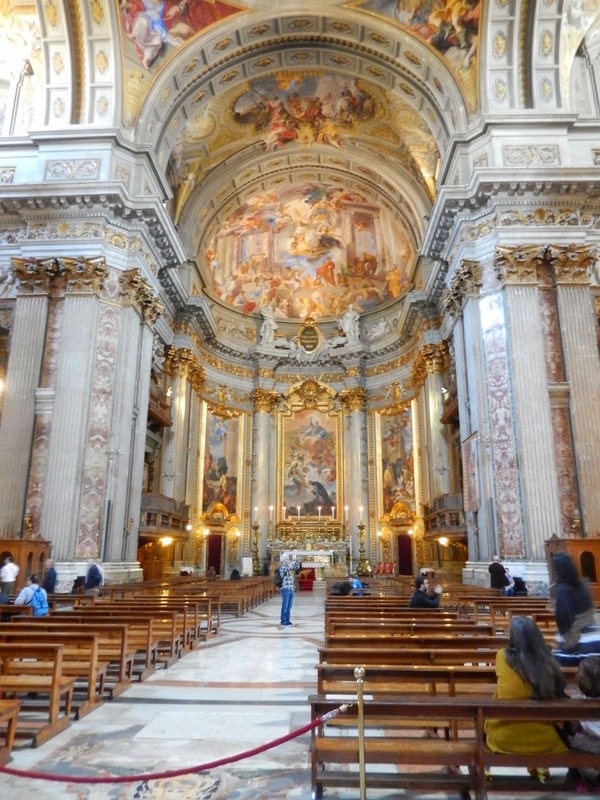 We headed next to Chiesa di Sant'Ignazio, a Jesuit church that I had read about; even Dan had never been there though, so we were excited to see its Baroque interior. 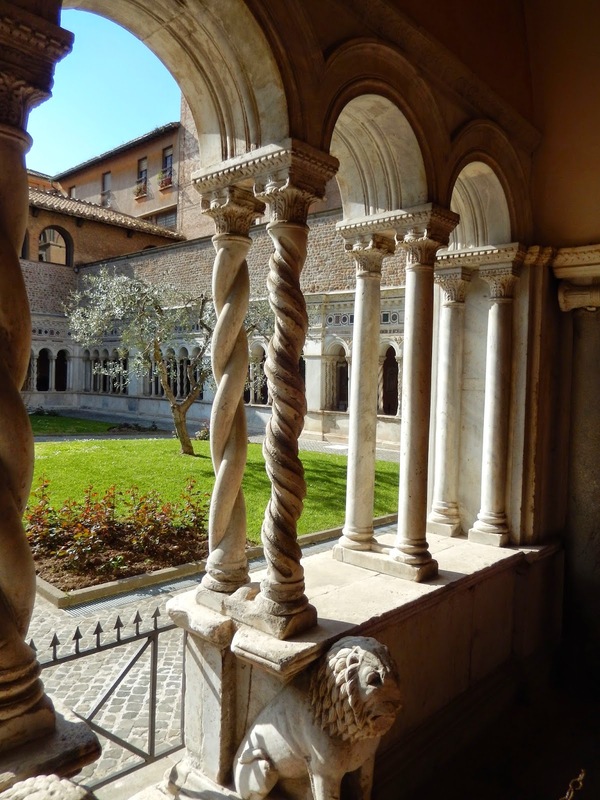 It was lovely, with beautiful frescoes on the ceiling and walls. 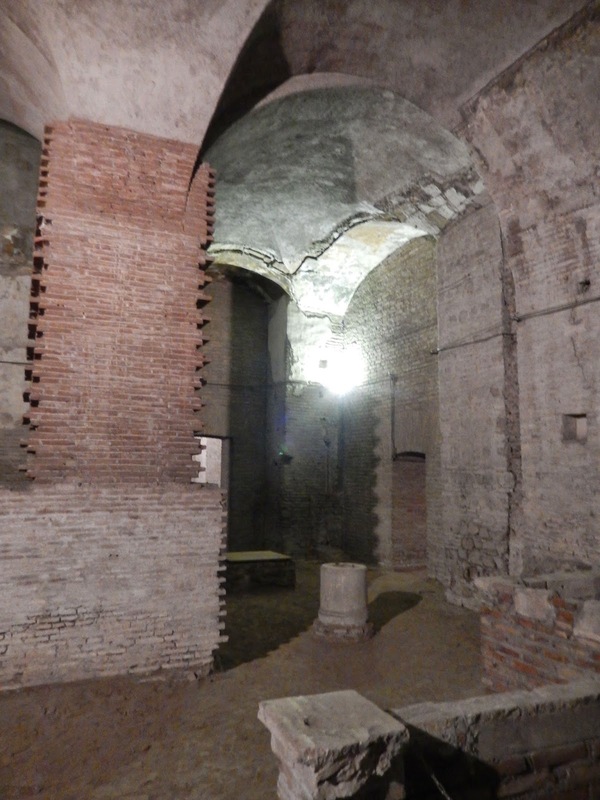 Dan had suggested that the students might wish to see the Capuchin crypt not far from the Spanish steps so we hurried there next. 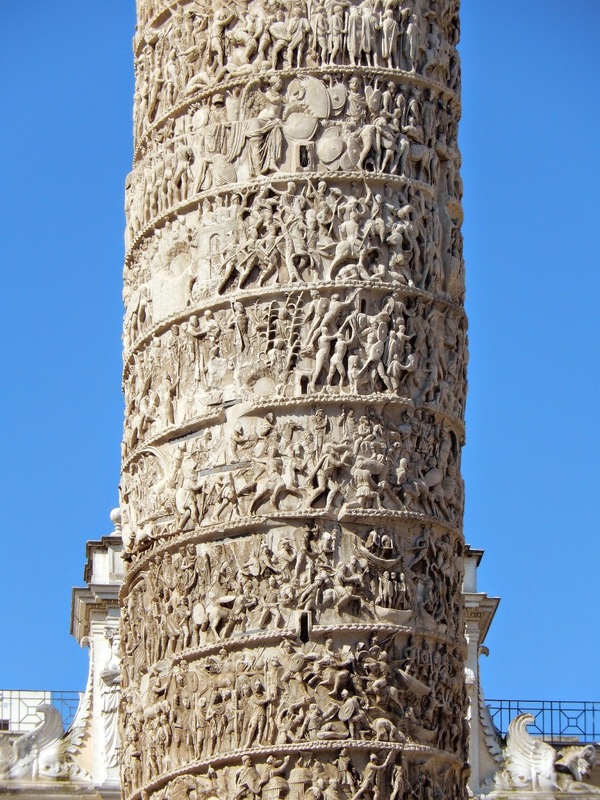 This oddity consisted of designs created using human bones - fortunately taken from bodies after they died - not before. The students loved it, of course. This ordinary building houses bone crypt. No photos allowed inside. At this point in the day, Bob and I split up from the others and headed by Metro to the west end of the city to see even more churches. 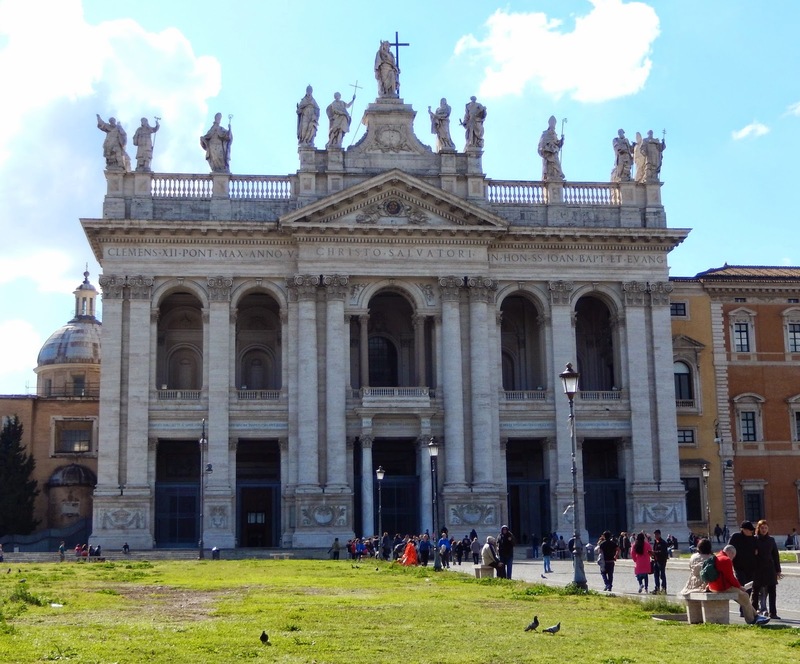 The Papal Archbasilica of Saint John Lateran (San Giovanni) was our first stop. This massive building is the seat of the Bishop of Rome (the Pope). 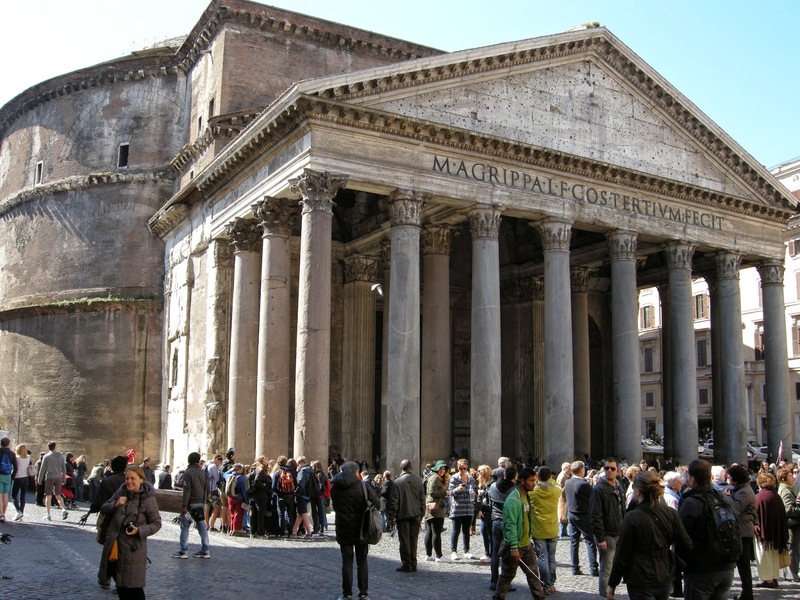 It is older than Saint Peter's in the Vatican and similar in size, with many features that suggest its importance. We were very impressed. The beautiful apse of the Archbasilica, with its very elaborate ceiling. 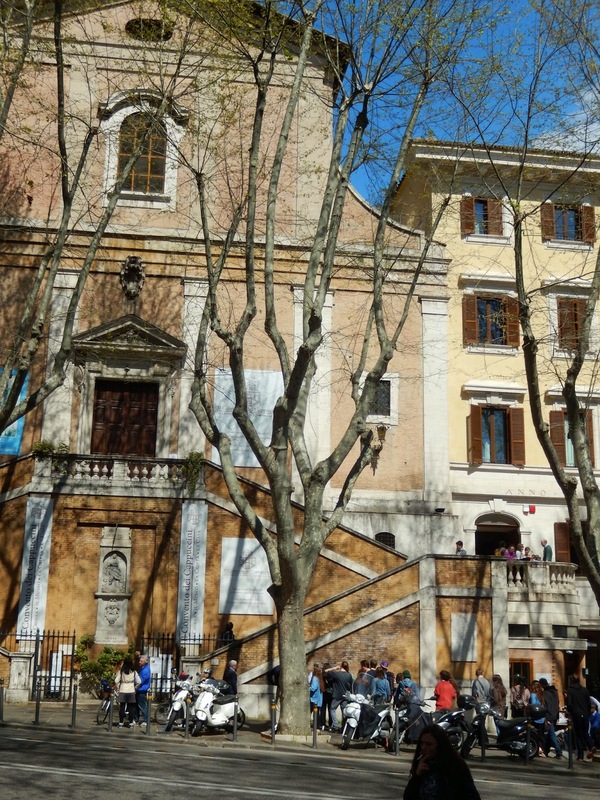 Nearby, we followed a group of pre-teens into the Scala Sancta, the "holy stairs" where pilgrims ascend the flight on their knees in order to honour the passion of Christ. At the top, there is a small chapel. This small building has great religious significance to Catholics. 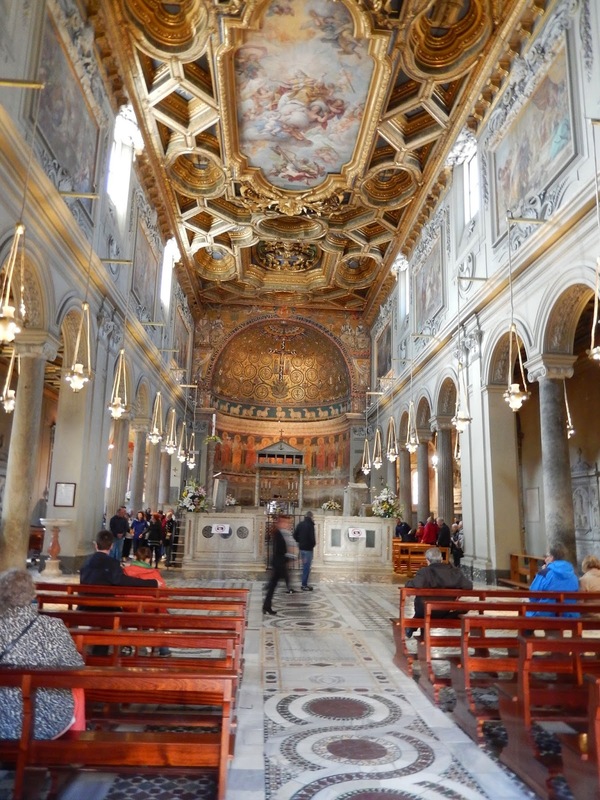 A few minutes' walk away, we entered the Basilica di San Clemente el Laterano, a small church recommended by the mother of one of my students. 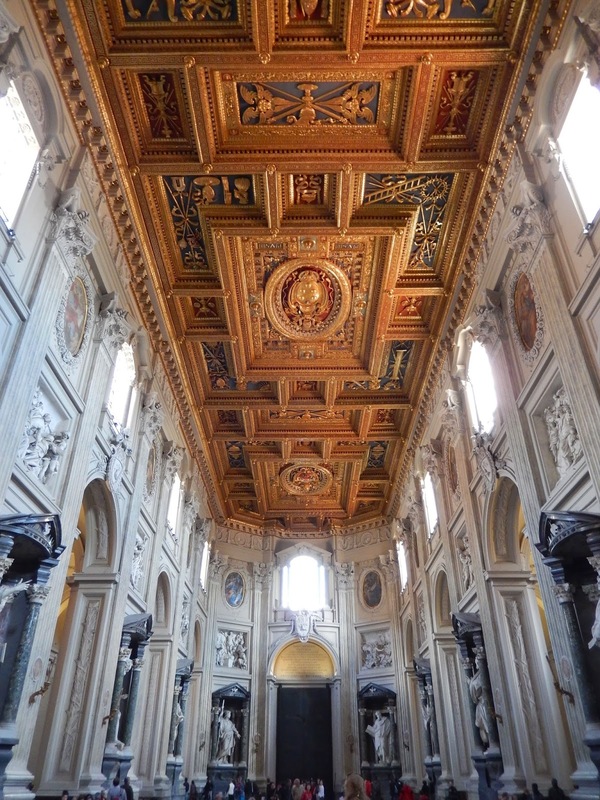 Like San Giovanni, the ceiling was particularly notable. At the end of a long day of touring, we decided to visit one more church, San Montino ai Monte, as it was on our route back to the hotel. It seemed unspectacular, until we descended into the crypt, where we discovered the remains of an older church further below. 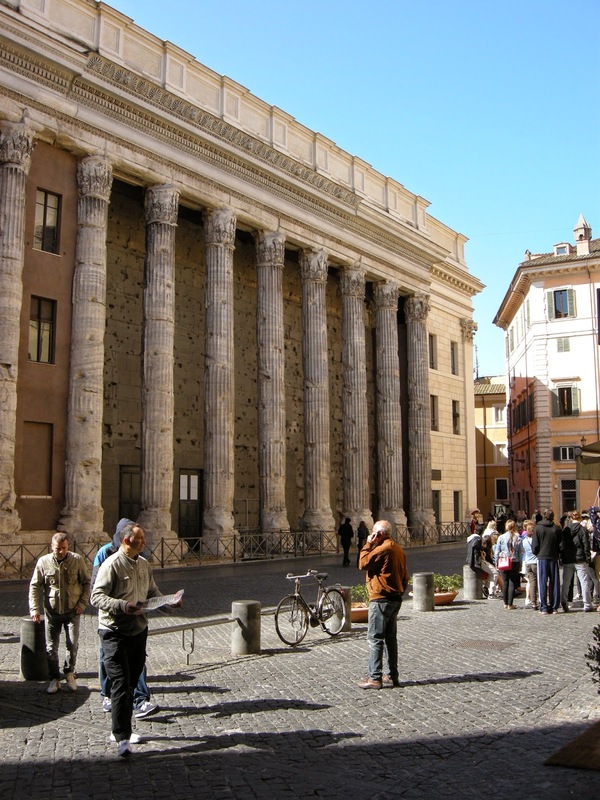 We had heard from our guide that Rome was a layered city, with many ruins below existing buildings and inadvertently, we had discovered such a place. Very cool. 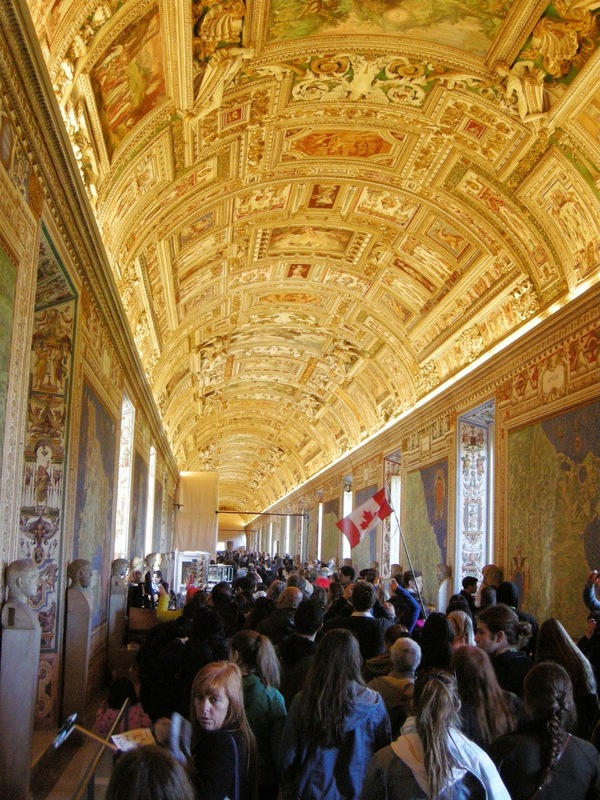 Martina, our guide, waves the Canadian flag as she leads us through part of the Vatican Museum. 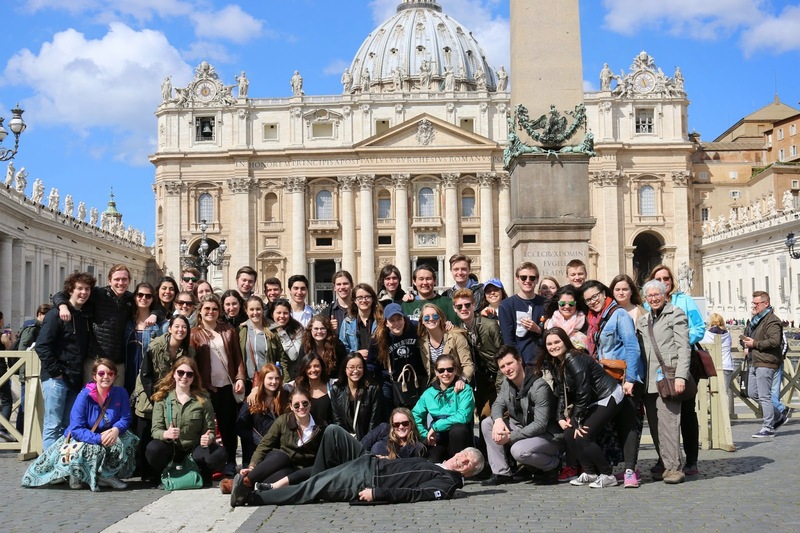 On our final morning in Rome, we visited Vatican City. 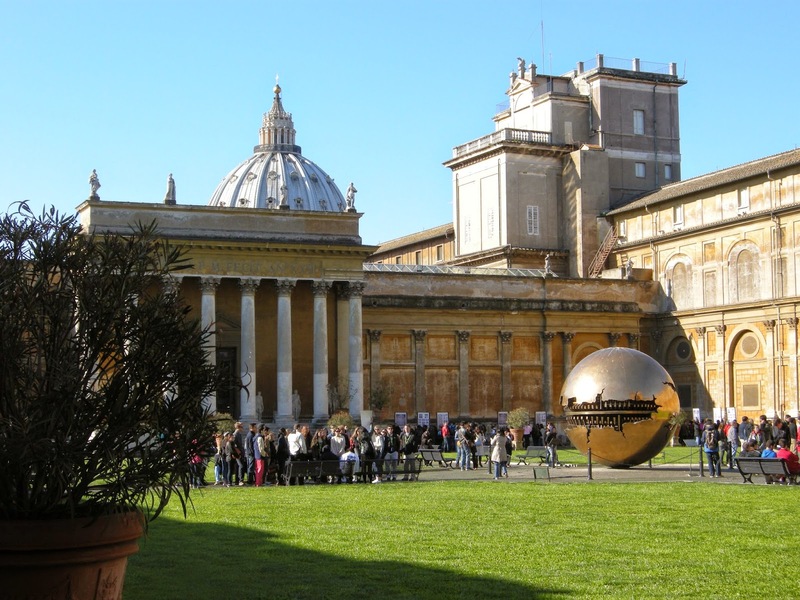 We spent a great deal of time inside the Vatican Museums, before entering Saint Peter's Basilica and the square in front of it. It was still set up for the Mass that had taken place there Easter Sunday. Just after lunch, we headed to our hotel and boarded our bus to leave the city. Arrividerci, Roma. You are a wondrous place, rain or shine!